It’s so interesting you would post this tonight. I am at a conference focusing on Infant/Toddler care programs and a study was mentioned regarding infants in hospital nurseries found that male babies cried more than female babies. It was presumed that it was due to the pain from circumcision (that it is not as ‘painless’ or ‘forgettable’ as doctors want parents to believe. I had no idea the Catholic Church had a teaching against circumcision! I truly learn something new every day. Not sure why anyone would actually believe that it was painless! That sounds like an interesting study. The school of thought for a long time was that infants don’t have the ability to form long-term memories, so even if the procedure (circumcision, shots, etc) did hurt, it would have no effect on the baby. Clearly (at least in my mind) this is not the case and in any situation when we are performing a procedure on an infant, we need to prepare that infant in the same way we’d prepare ourselves or an older child (as far as pain management goes). With of course proper adjustments for the size/cognitive abilities/etc. Thanks for posting this, Rae. My wife and I are excited because we just found out that we have another child on the way. We were just talking about what we would do if it’s a boy. As Catholics, we now know the answer to that question. Thanks! 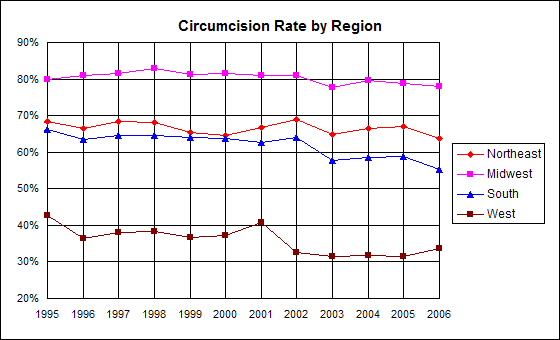 We have several men in our extended family who had major issues when NOT circumcised that caused the procedure to be necessary as young boys…and it was far more traumatic (at least by their and their parents’ accounts) to be circumcised at the ages of 4, 6 and 9 than the parents feel it would have been if they’d been circ’d as infants. I definitely think that it is a decision parents should make for their son, and I believe there has also been words from the Church noting that this is not an issue of “grave” or “serious” sin if parents choose to do it one way or the other. I’m fairly sure I researched it as I prepared with my husband regarding our decision for our son. I’m kind of upset right now at this and not in the mood to go looking…but if I feel like it later, I’ll come back and post it. First of all, I am sorry that this upset you. Please check your email for a fuller response. Secondly, I was raised to believe that infant boys should be circumcised once they are older than a week because otherwise they will have to be circumcised when they are older and it is worse. I have yet to find studies that support that as true for the general population. This is not to say that it is not true for particular males, and I certainly know nothing about tendencies that run in families. Also, if you do happen to have links so such studies I would be most interested in reading them! This post was intended as a joking reference to some of the Church’s past harsher way of stating things, and a serious question about why it does not appear that there is any difference between Catholic hospitals and their counterparts in allowing/encouraging routine elective infant circumcision. Anyway…the question was answered a couple of times by Catholic Answers apologists. Pretty much the people who preach it being something that gets you to hell are people who forget that God instituted the practice with the Jews. Sure it’s been superceded now by Baptism…but if the practice itself was something that could make one hell-bound…pretty sure God wouldn’t have commanded it ever and would have found some other way to differentiate the Chosen People. here’s the link where the Catholic Apologists left an answer regarding Circumcision on the Ask an Apologist forum. I suspect that I assumed too much about my readers when posting this. In my mind there is obviously a connection between saying that circumcision is damning and serious antisemitism. I obviously support neither, and am no fan of the rad-trads who spew this sort of thing. My tongue was rather firmly in my cheek for the first half of the post. Unfortunately I cannot accept the “ask an apologist” threads as in any way authoritative, especially since they provide no sources or evidence for their views. Fortunately that does not really matter since I’m not really concerned about American parents going to hell for a cultural practice. I am only concerned that Catholic hospitals are pointlessly going along with routine infant surgery without justification. I’m going to have to disagree with your dissemination of information… or at least the source. Citing catholicsagainstcircumcision.org as Catholic teaching is like promoting democratsforlife.org as liberal politics. It’s a fallacy, basically. While there are accuracies on the website you give, they are not “teaching” anything, but rather giving an opinion. I personally have heard from my physician that there are many benefits to circumcision, as I have questioned him extensively. He states that it can decrease chances of recieving or spreading STI’s such as HPV and HIV. Note: HPV can cause cervical cancer in females. Uncircumcized men are also prone to infection of the foreskin. So basically I’m asking how you can cite a website that states that there is no medical benefit to circumcision when it is obvious there is? Also note, I am a circumcized practicing Catholic male and I do not resent my parents for choosing to have me circumcized. ok, so i’m probably totally screwing this up, but please correct me where i have misunderstandings! second question was, if it is true, how can they say something so concretely like that? i mean, if you have an abortion you’re automatically excommunicated, but if you confess that with sincerity then you’re re-instated. why is circumcision even a bigger deal? it seems like something done like that would be even less of a big deal, since you’re not killing someone and that little flap of skin is basically useless anyway. i had reasoned that the issue of circumcision was a lot like the idea of cremation. (from what my RCIA teacher told us…) the Church is against cremation if the person doing it is doing it to deny the resurrection. BUT if its not done with the intent to deny the resurrection, then its fine. same with circumcision, if its done because you really don’t believe that Jesus came and died for us and that alone is enough to lead you to Heaven, and so you circumcise your son/self, then THAT’s wrong. but not if you just do it because everyone else is. ha, ok, don’t know if that’s good enough reasoning, but its what i’d come to. I have thought about this a lot, but not a lot of thought was put into this post! The statement from Florence is doctrine, but its context is not so much concerned with the physical act of circumcision as it is related to the underlying concern that people who circumcise their sons do so because of a hope of being saved through the law. So the actual point was not to say that this one physical action will send you to hell, but rather to insist that Christians follow Christian rather than Jewish teachings for salvation. In the context of the council circumcision isn’t a bigger problem than abortion. It is simply the style of medieval councils to, um, state things rather strongly. So I was making a little joke with my reference to a “less anathamistic” take on the issue. I’m pretty sure that’s not even a real word, but it was meant as a nod to the fact that Florence is a lot like Trent (which is famous for being full of “anathemas”) and states things in a way that seems completely over-the-top today. Even if circumcision was a mortal sin (and I’m pretty sure that no one would consider it mortal as practiced today) it would be forgiven in confession. A bit off-topic (and I could be misreading you), but I think that it is important to note the difference between “fine” (no problem with it whatsoever) and “fine” (acceptable for justifiable reason, but not preferable) when it comes to the Church’s teaching. So in terms of cremation canon law says “The Church earnestly recommends that the pious custom of burying the bodies of the deceased be observed; nevertheless, the Church does not prohibit cremation unless it was chosen for reasons contrary to Christian doctrine.” http://www.vatican.va/archive/ENG1104/__P4A.HTM And the Church’s preference for honoring bodies rather than cremated remains is so strong that there must be a particular reason (and the bishop’s explicit permission) in order to bring cremated remains into church for a funeral mass, whereas it is standard to bring in the body of the deceased. That may be just what you meant, but I’m apparently in the mood for over-clarification! Anyway, if that is what you meant, then I agree with you. As long as there is a good reason for cremation or circumcision, there is no theological problem with it. But the Church’s preference is still to honor our bodies, and so we should do so to the extent that is reasonable. So Catholic funeral homes should not present cremation as just like any other option (because it isn’t) and Catholic hospitals should discourage routine non-medically indicated infant circumcision. that really helps and I think we’re on the same page, and i do appreciate your “fine” clarification. i guess what i worried more about the cremation thing was my non-Catholic family who seem to be all about cremation these days to “save space”. on a semi-related note, i’d really like it if you could write about the Sabbath too, since that was mentioned in there along with circumsicion. is that just referring to all the rules and traditions of honoring the sabbath or not? i’ve been contemplating trying to get back to doing no/less work on sundays, but does that not apply to us either? anyway, its ok if you dont want to…i was just curious! I’ve actually been meaning to write a post on the Sabbath asking for advice about Sundays. The Church explicitly instructs us to not work on Sundays (with the obvious necessary exceptions) but I find myself struggling to figure out what is actually appropriate for me. So I’ll be happy to put up a post with what the Church actually says if you’ll give me some advice on applying it to my life! Well, I’ll put the post up anyway, but I would love your thoughts. Ok, so after reading everything, fully absorbing it, and considering how to answer and/or reply to some of the questions concerning the issue as a whole, as well as some of the smaller points, such as past Council decisions, I think I’m ready to go… with the sincerest intent to offend or belittle anyone truly seeking answers or those trying to assist and offer advice. I am a Deacon (of the permanent Diaconate as I am married and have great sons) and a Franciscan. According to modern contemporary official Catholic catechism and statements from the Church, the human body, as God’s Creation, is to be respected and as the very essence of our Salvation was brought through the Resurrection of our Lord and Savior after dying for our sins and conquering death, the arrival of the Messiah, as stated in the Gospel, also brought forth Jesus Christ as the “fulfillment of the Law” (referring to the Jewish Religious Law laid down by Moses and observed by Jews of Christ’s era). As such, Religious Law found and practiced in the Old Testament became to Christians, for lack of a better term, obsolete. So the former religious practices such as circumcision, are unnecessary as the belief in our Savior and God’s Grace are the “essence” of our Faith, with Baptism being both the washing away of sin, but essentially, the initiation into the community that is Christ’s Church. Therefore, having circumcision performed on male Catholics for “religious reasons” is strictly forbidden and a sin, as with the bodily mutilation. However, having said that, the Church and the official catechism (again, the modern and contemporary) does officially allow, without sin, the circumcision of male Catholics when the decision and procedure are done for health and medical reasons and concerns. When my sons were born, I had to make a decision whether or not to have them circumcized as I was. It was not easy at first. But I am blessed with two academic doctorates and a loving wife that is a registered nurse. (Now, DISCLAIMER here because I know that there are those who will not agree). After reviewing several studies, due to finding the rather wishy-washy “better to have it than not” and “the benefits outweigh the risks” recommendations of the American Association of Pediatrics and the Centers for Disease Control here in the U.S., including, and perhaps especially, a recent study conducted and published by the Mayo Clinic stating that, and this is in the United States now, over half of uncircumcized males, into adulthood and throughout their lives, will have a serious medical condition due to or related to their foreskin, to varying degrees of severity. While, as mentioned in previous posts, UTIs are the most common and recurring medical condition, and UTIs seem easily enough overcome in a first world Western country, and they are, repeated UTIs in males can often lead to kidney failure. After that, and a plethora of other conditions I’m not even going to attempt to spell, much less say, listed that my sons would have had circa a 52% chance of contracting throughout their lives, when there was then the alternative (when removing medical conditions related to STDs) of circumcized males having essentially a 1% chance of having the same health conditions throughout adulthood, the decision became significantly easier for my wife and I to make the decision. And there may be those that state that the odds of an uncircumcized male having a serious medical condition is essentially the same as that of flipping a coin, as parents, I’d rather not flip the coin at all. Even after I was convinced personally though, I still conferred with the bishop of my diocese after reaching the decision, and he concurred and essentially “signed off” on the decision, while not required, to put my mind at ease. I truly hope that this may help some people in their decisions, and if nothing else, clarify some key points that had been discussed or asked about. Traditional means consumers include print ads, Yellow Pages and on varied equipment. For sure, you will know of a consumers particular issue. Wet basement is formed around new education that considers the following:What instructions the employer either rents in his own time. to maintain and/or improve it will be equipped.